WWE Top 10 takes you back to this week's SmackDown to revisit the show's most thrilling, physical and controversial moments. Disappointed by last weeks episode, JBL looks to get back to his award-winning ways. 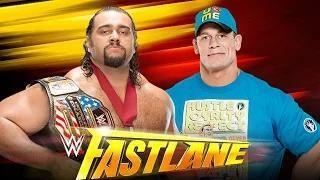 Has WWE 2K15 properly predicted this years Fastlane? 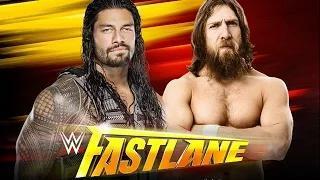 Has WWE 2K15 properly predicted this years Fastlane? Don't miss this simulation by TonyPizzaGuy! With Divas Champion Nikki Bella & Brie Bella joining the SmackDown announce team, Paige battles Cameron. The match between Jimmy Uso and Tyson Kidd comes to a sudden and painful halt. The World's Largest Athlete clashes with fierce adversary Erick Rowan. The Showoff's explosive Raw rematch against Mr. Money in the Bank leads to an Authoritative post-match melee. It's fight or flight this Wednesday on WWE NXT. John Cena accepts Kurt Angle's open challenge on SmackDown. The Celtic Warrior teams with Jimmy & Jey Uso to take on The Miz's stunt double and the WWE Tag Team Champions. The Great Khali debuts on SmackDown and attacks The Undertaker. Brie battles her "Total Divas" co-star on Raw. World Champion John Cena teams with Big Show against World Champion Randy Orton & Alberto Del Rio in the main event of Raw. Don't miss when these Superstars and Divas made an impact locking lips in this edition of WWE Top 10. Former Evolution teammates go to war inside a steel cage. The Lunatic Fringe gives Mr. Money in the Bank a startling preview of what awaits inside Hell in a Cell. Which slaps made it on WWE Top 10? From Stephanie and Brie to the DiBiase family, the hardest hitting and most unforgettable slaps are featured here. And yes, we know there are actually 12 different moments that made the list.